The laws regarding foreign ownership were relaxed recently, ostensibly to allow temporary visa holders to buy properties at auction which was previously too difficult. I was quite outraged after piece after piece appeared in the media with real estate agents bragging about Chinese buyers putting down their money over the phone without even seeing the properties, or purchasing several. These agents talk about how the wealthy investors are speculating on our real estate, and even letting the properties sit empty while waiting for their capital increase. It is confusing to know exactly what is happening as only temporary visa holders are allowed to buy established properties, and then only a principal place of residence. But we hear of some of these people buying several. I checked on the FIRB website and established that these practices are in contravention of the intentions of the foreign ownership guidelines. Foreign investors are not supposed to speculate, or engage in activity that would lead to housing stock shortage. It seems that Rudd's plan to keep the housing boom going (and possibly satisfy friends in China?!) has gone too far. I penned a letter and sent it to all house of representatives members. I have had some good responses so I will wait to see with interest if anything happens. We are losing prosperity when we sell out to wealthy overseas investors that we can't compete with. On top of the loss of prosperity we lose in many other ways with the associated population growth. Real estate speculation has been made possible on a level never previously conceived of due to the global Internet, through property dot coms like www.realestate.com.au and www.domaine.com.au, but also through very rapidly converging and mushrooming of industries and professions across government and private sector, so that we have, for instance, on the one hand, at the Federal level, the National Foreign Investment Review Board (NFIRB) positively facilitating foreign investment in local real estate and facilitating purchases by temporary immigrants for high turnover, and, on the local level, realtors touting local property internationally with the assistance of privatised migration agents and local solicitors, and at State level (where land use planning is controlled), organizations like the Property Council of Australia (APC), closely involved with determining government policy. 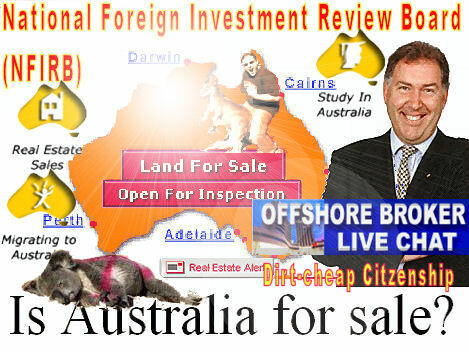 For more on this see "Bad Australian foreign investment laws marginalise Australians" or, for more detail, S.Newman for SPA VIC First Home Affordability Enquiry Submission, pp 16-20. According to one recent article in the Herald Sun, Chinese buyers now account for around 30 per cent of house sales in Melbourne. The article notes that the Asian buying spree is pushing up prices and worsening the housing shortage. The Herald Sun article quotes Jin Shang, real estate agency Jellis Craig's first Mandarin-speaking agent, as saying: "Chinese want residential properties here because they feel comfortable in Australia's multicultural environment and they know it has one of the world's best education systems." So, the Chinese are not coming because they have any interest in the institutions, people, culture, traditions, or natural environment of Australia. No, they are coming because they want more comfort, better education services (courtesy of the Australian taxpayer), and a "multicultural environment" that allows them to surround themselves with fellow Chinese so that they never have to integrate into wider Australian society. We need some old-fashioned patriotism in Australia! Japanese company Kirin Holding will now combine juice, dairy and alcohol operations into one company, Lion Nathan National Foods, and become the largest supplier to Australian supermarkets with a portfolio of prominent brands. Tasmanian farmers are being paid less than 21c for every litre of milk by National Foods, well below the cost of production of about 39c a litre instead of 50c per litre. National Foods executives recently claimed they had no obligation to help farmers. Why did the Federal Court approve of selling out our dairy produce? We already have globalisation of tertiary education, real estate, population, jobs, and now an iconic Australian product - the dairy industry! Australian produce should be for Australia, not overseas exports and overseas owners. This is a betrayal, a sell-out by the Federal Court. This industry is cruel, a heavy water consumer and not sustainable. The solution, economically and environmentally? Funding to restructure the industry and create plant-based dairies, and rekindle some old-fashioned buy-Australian patriotism into our nation! Even just 4 houses sold to a foreign buyer for 20 million in Brighton as I understood happened recently, pushes 4 Australian buyers who missed out further down market pushing up the prices of many more houses which would have been bought for less than 5 million each which in turn pushes up the prices of many more houses further down the chain. It is true that as the number of houses affected increases as we move further "down market" the actual increase in the price is less but the purchasing power of those in this market is less and so they are adversely affected. Unfortunately it is is not just 4 houses though- it is lot's more and it is ongoing. This effect is real becasue houses are a relatively limited commodity- not a commodity where the supply can easily and swiftly be increased and within a given area they cannot be increased at all except by densification which means that the quality of the commodity decreases. The child like voice of Lindy Burns asked rhetorically and gaily one day on her afternoon drive show why Australians should expect to own a home. Well done Lindy!- it's good to normalize decreasing housing affordability when that's what we are getting. Not good for the bulk of your audience but good for those who profit from housing scarcity and rising prices. What would forefathers, who fought in New Guinea, have thought? Think about how things would be today if, in the 1930s and 1940s in Australia, our political leaders had been prepared to make peace with the Japanese at any price, instead of preparing this country to defeat the threat from the North. How differently things would have turned out then. Today, not only are houses in which native Australians previously could expect to live, been flogged off to cashed up foreigners, but our mineral wealth is being bought up and publicly owned assets are being sold. What would our fathers and grandfathers who fought in the jungles of South East Asia to defeat a threatened Japanese military invasion make of our circumstances now? I recall Geoffrey Blainey, Australia's most eminent historian, claiming back in the 1980s that the Federal Government had effectively adopted a "Surrender Australia" policy. Blainey observed, ".. we jump as a nation from extreme to extreme. The old White Australia policy said rudely to half the world: Keep out. The new Surrender Australia policy says to that half of the world: Come in." Fast forward to the present day and we have the likes of Bernard Salt arguing that we need to accept China's surplus millions or otherwise they will force them upon us - a view seemingly shared by Australia's political elites. For even if our elites don't accept the view that Australia has no choice but to become Lebensraum for Asia's masses, their immigration policies are nevertheless turning Australia into precisely that.